Deciding how much information to include when writing about contemporary art can be a curious struggle. Historical and visual description are certainly necessary, but how much is too much and where is the line to be drawn between enhancing and infringing upon one’s actual experience of an exhibition? This question struck us as particularly pertinent following the opening of the highly anticipated and conceptually complex exhibition Thomas Demand: Animations, curated by John Zeppetelli, at DHC/ART. On the eve of the opening we attended a conversation at the Phi Centre between the artist and the infamous art historian/critic Michael Fried, who has written the primary essay in the exhibition’s catalogue. Not surprising in a city overflowing with artists and academics, attendance at the event was so great that the discussion had to be simultaneously televised in another room to accommodate the crowds that had poured in to see what we can now only refer to as “Fried on Demand.” Fried was amicable and easygoing (a surprising contrast with the caustic and canny criticism for which he is known) and Demand offered an abundance of anecdotal information and charmingly orated backstories for the works on display at DHC. In addition, we were provided with an incredibly detailed account of the works’ construction. Despite enjoying the evening, we left the event wondering whether the detailing of the process, and the processing of the details, might ultimately overshadow the show. After all of this information, what else could the images – so obstinately opaque and withholding of particulars – possibly have to say? We wondered as well how one’s experience of the exhibition might differ depending upon whether he or she had attended the talk or had prior knowledge of the artist’s work. In our case, the experience would certainly be shaped by all of this information (not to mention our exposure to the elephantine tome that is Michael Fried’s Why Photography Matters as Art as Never Before – an astute and elaborate book that, for all its repetition, could probably have been summed up in a text message, but offers an articulate analysis all the same). In opposition, the works are reputed for their unflinchingly obdurate silence. Occupying both buildings of the DHC/ART complex, Animations includes photographs and films and (while we intend to discuss certain other of these works at a later date) here we focus on the photographic project Embassy, which inhabits the majority of the main building. The walls have been covered with dark green wallpaper mimicking the folded fabric of heavy curtains, giving the impression that something is being concealed from view. The shrouded space – decorated with life-size photographs of banal objects and office interiors – evoke that most destabilizing final episode of Twin Peaks, in which everything is curtained and nothing is certain. 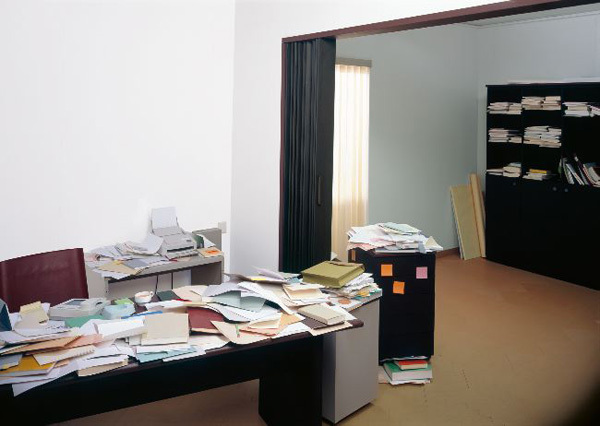 If the walls themselves seem to be suppressing secrets, the photographs are no less revelatory: images of doors (most closed, some open or ajar); desks littered with documents; filing cabinets piled high with papers and covered in post-it notes; empty hallways and uninhabited rooms. Playing with their scale, the photographs are hung at heights similar to where they would appear in real life, so that a picture of a door begins almost at the floor and the surface of a desk bisects the wall at an oddly low level. The entire space is designed with the pretense of accommodating presence. The spectator is tacitly acknowledged and elided at the same time. It is like being invited over to somebody’s house and then being ignored. Within the images themselves, all evidence of human presence has been eradicated. Every sheet of paper is blank, the accounting devices and clocks are missing their numbers and there is no food or labeled packaging in the garbage can. 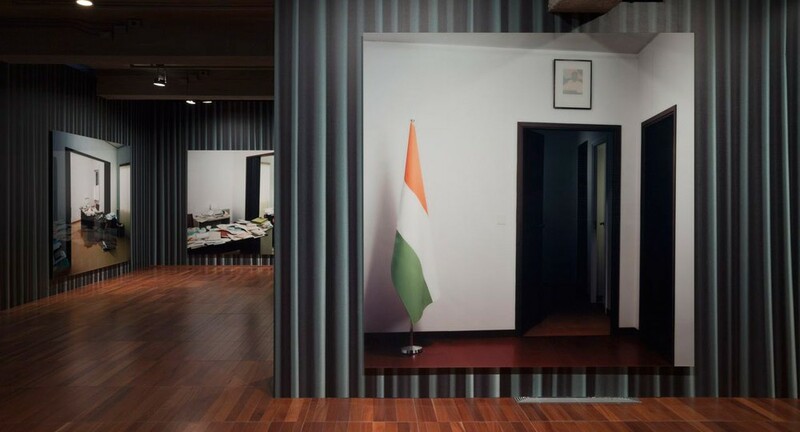 Embassy perpetuates a constant in Demand’s work: his photographs do not actually image an office desk, for example, but a meticulously constructed paper and cardboard reproduction of an office desk. He builds his photographic subjects by hand – typically from other photographs, but in the case of Embassy, from memory – with such incomprehensible expertise that the only real proof of an image’s fabrication is its lack of specific detail. The textual traces and messy markings of human presence or exchange are the elements left out of the process of transcription, while transcription itself is a process of making markings. To quote Fried on Demand, “Such an aim is made all the more salient (and all the more puzzling) by the repeated choice of scenes of crimes or other notable events, scenes that in their original (or originally photographed) manifestations inevitably bore traces of those events on those surfaces” (Why Photography Matters as Art as Never Before, 269). These conditions are particularly convoluted in this case, wherein the subject is the Republic of Niger Embassy in Rome and its illusive inclusion in the controversies surrounding the 2003 American invasion of Iraq. (The building was the scene of an alleged theft in which stolen stationary incited a political maelstrom of suspicion that supposedly served to justify the U.S. advance on Iraq. But without this information evidenced in the images the question again arises: How important is the story?) An embassy is a peopled place, but not easily accessible for most of the population. It controls the trafficking of humans, but abstracted as information – people as paperwork, identity by numbers – and it is the existence of that information that is actively excluded from Demand’s images. This eradication of human presence from the photographic field is not only particular to Demand’s work, but is evident in other exhibitions concurrently taking place within the city and we therefore want to make a quick detour to the Musée d’Art Contemporain de Montréal. Opening shortly after Animations, Lynne Cohen’s False Clues, curated by François LeTourneux, is made up of a series of large-scale photographs of unpeopled interior spaces. Not unlike Demand’s attempt to gain access to the confidential quarters of the Niger embassy, Cohen’s more recent photographs depict locations that affect but are not typically open to the public. Exemplary of this is the number of photographs taken inside a military training facility. Although they appear almost interchangeable in some cases, there are, of course, stark differences between Cohen’s and Demand’s work as the latter builds his environments, while the former turns to “ready-made” and real locations. Following the logic of the ready-made and taking things as they are, it is often remarked that Cohen doesn’t alter or intervene in the spaces she selects. Obviously, that cannot be entirely accurate and strategic choices must have been made, but the evidentiary marks of human occupation do remain in the otherwise empty spaces. Among other things, there are signs offering directions to exits and voicing various prohibitions, there are labels and scribbles and graffiti on the walls. A black-and-white- photograph depicts a chalkboard bearing two crude and cryptic diagrams: one with arrows pointing out and another with the arrows pointing in. Stains on the walls and scuffs on the floors provide a visceral index of human activity. Unlike Demand’s embassy, people have been in these spaces and will return to them again. 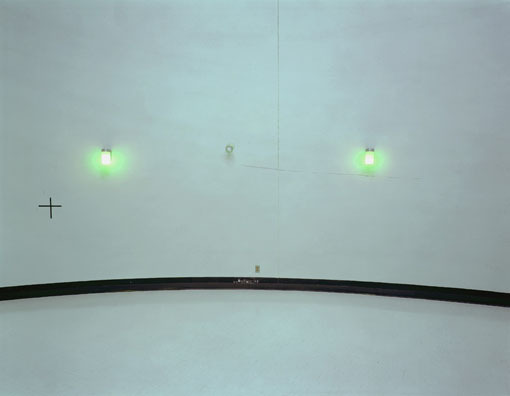 In fact, it is not entirely accurate to say that there are no humans present in Cohen’s photographs. There may not be living people pictured, but a number of the images feature dummies. Life-size human dolls produced for target practice are dressed up like security guards and civilians and riddled with bullet holes, thus providing the most striking and concentrated evidence of human expression. It is the presence of these dummies and the violent marks on their false bodies that most chillingly illustrates the central paradox of markings and erasure in both Demand’s and Cohen’s images. In each of these exhibitions, the spectator is offered a glimpse – whether real or fabricated – of institutions that are typically off limits and that occupy an essential position in the social imaginary as purveyors of both protection and control. Whereas Demand activates an elimination of human occupation and activity in his work, the bullet holes in Cohen’s photographs are the marks made by machines capable of actual eradication. These exhibitions each remind us that we are consistently confronted with visual codes and clues and that our task is to identify patterns and decide which details matter and which signs to follow. In the absence of markings we suspect that the details might be behind a curtain, and so we go looking for them. This entry was posted in Uncategorized and tagged Contemporary Photography, Lynn Cohen, Michael Fried, Thomas Demand. Bookmark the permalink.